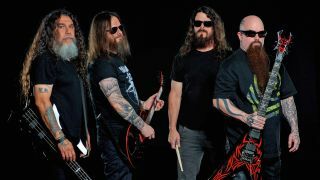 Slayer have confirmed their 11th album is called Repentless – after a song inspired by late guitarist Jeff Hanneman – and it’ll be released via Nuclear Blast on September 11. It’s their first record since Hanneman’s death in 2013, with Exodus’ Gary Holt in his place. It’s also the first since splitting with drummer Dave Lombardo earlier that year, and bringing back Paul Bostaph. Kerry King recently told Metal Hammer: “There’s a couple of songs that are going to be on it that the fans might know. Atrocity Vendor was released in the States on the B-side of some single so now it’s Atrocity Vendor 2015 – it’s completely re-recorded. Other titles include Vices, Take Control and Cast The First Stone, with a total of 12 tracks on the follow-up to 2009’s World Painted Blood. Slayer are cover stars of the current edition of Metal Hammer, on sale now.